A child prodigy, Henry Brougham (1778-1868), later Lord Brougham and Vaux, entered in 1792 the University of Edinburgh, where he focused on mathematics and then law, while his amateur scientific studies led him to become a fellow of the Royal Society at the age of twenty-five. Called to both the Scottish and English bars, and moving in radical political circles, he became famous as a defender of free speech, a passionate abolitionist, and co-founder of the Edinburgh Review. After many years as an MP, he was given a peerage in 1830 and became Lord Chancellor in Lord Grey's Whig government, where he was instrumental in the passing of the 1832 Reform Act. This three-volume autobiography was published posthumously in 1871, with additional notes. 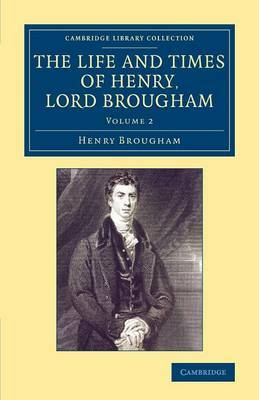 Volume 2 covers the period 1811-28, including the scandal of George IV's marriage, during which Brougham advised Queen Caroline.